Realtor.com has raised the cost of exclusive leads from one of the popular real estate portal’s “bread and butter” ad products for agents and brokerages, Connection for Co-Brokerage. The ad product now also offers agents additional information about consumers contacting them via lead forms — changes realtor.com operator Move Inc. says are meant to improve connections between agents and consumers. Two Connection for Co-Brokerage subscribers (mentioned below) supplied Inman News with details about the product’s revamp based on discussions they had with Move salespeople. Move corroborated that the details are accurate. 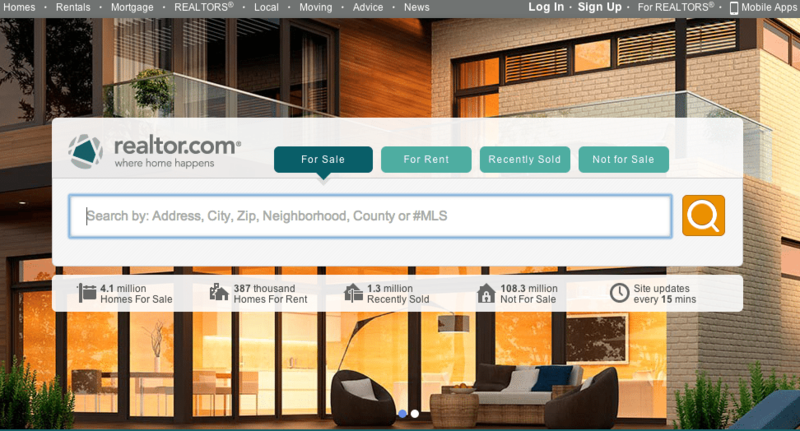 Connection for Co-Brokerage allows brokerages and agents to collect leads from contact forms next to realtor.com listings. Since launching the product in 2011, realtor.com has sent a contact from one lead form to just one agent. 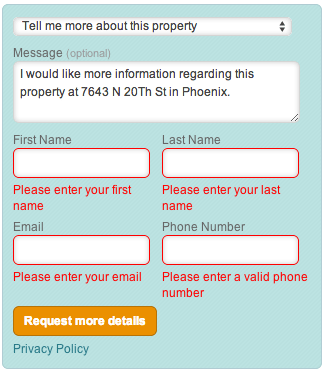 Connection for Co-Brokerage lead forms next to realtor.com listings now require consumers to enter a phone number. As of July 1, Move is offering two tiers of the product for new and renewed contracts. The firm introduced some of the changes at its investor and analyst day in May. Now, brokerages and agents can pay 75 percent more than they did before the revamp to receive leads on an exclusive basis, or pay 10 percent less and share the lead with one other agent. In the latter case, both agents will receive the lead at exactly the same time. 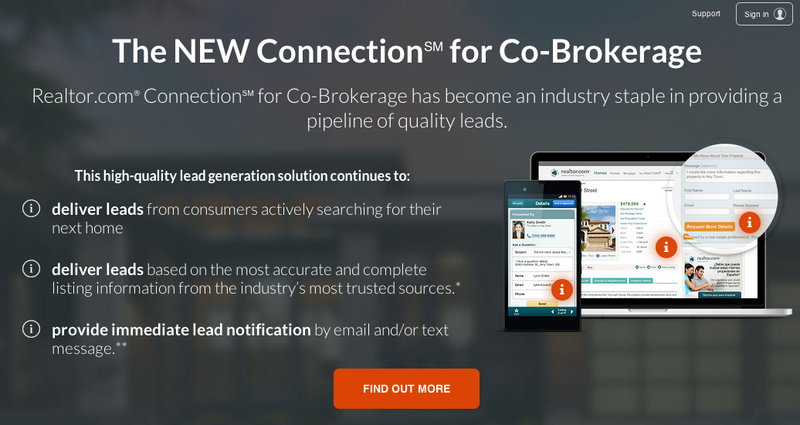 All Connection for Co-Brokerage leads, regardless of tier, also now include some significant enhancements. For example, consumers must now enter a phone number before submitting a contact form on a realtor.com listing, an action not required before. 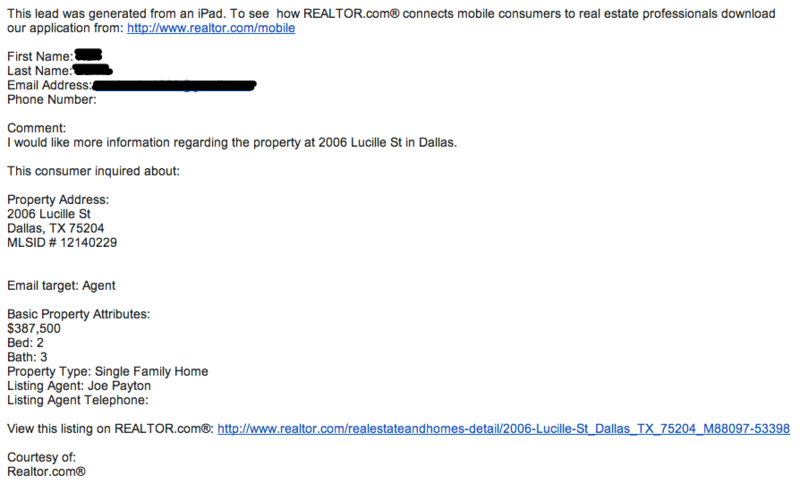 That phone number comes to the agent via a lead-contact email realtor.com sends agents. That gives agents the ability to reach out directly by phone, making for a higher-quality lead. Lead-contact emails will also come to agents with information about consumers’ behavior on realtor.com, if available, including a display of three additional properties the consumers have looked at on the site, the pricing and home parameters that they’ve searched for on realtor.com and how long they looked at the home they contacted the agent about before clicking the lead form. Leads also include demographic information, household income and other data to help give the agent insight into the consumer. 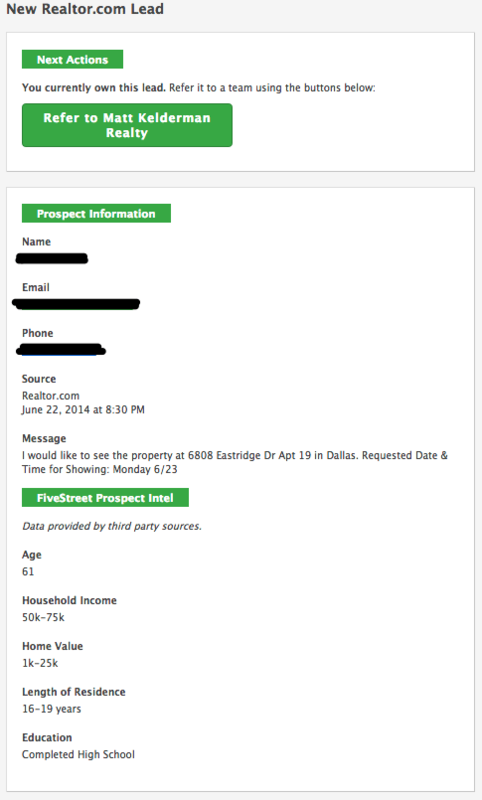 Connection for Co-Brokerage leads now include phone numbers, demographic info and lead follow-up tech from FiveStreet. Agents can follow up with leads immediately by text or email using technology from FiveStreet, a startup focused on lead response and consolidation, which Move purchased in October. All these enhancements come standard in the new Connection for Co-Brokerage offering. “The changes are designed to increase the likelihood that the consumer receives a timely response and to help bolster contactability between the agent and the consumer, by improving the agent’s ability to connect with and quickly build a relationship with the consumer,” Tracy Mahnken, senior vice president of product management for Move, told Inman News. Move sells Connection for Co-Brokerage leads by slices of ZIP codes, guaranteeing a certain return on investment to brokers and agents per slice. Move opens up a new slot in a ZIP code when it can guarantee a minimum number of leads in that slot, Move Chief Financial Officer Rachel Glaser said at Move’s investor and analyst day in May. Prices for Connection for Co-Brokerage are segmented into eight price tiers that are keyed to home prices and realtor.com traffic, Move told Inman News in May. Glaser estimated that revenue per slot could jump two to three times when the new pricing is fully rolled out, possibly within the next six months. By providing Connection for Co-Brokerage exclusively on a one-to-one basis, Move felt it left revenue on the table that its competitors in the industry are gobbling up, Glaser said. 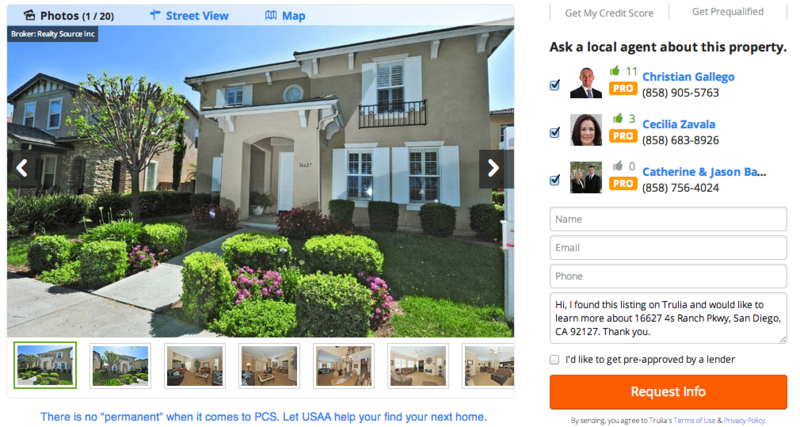 The nonexclusive lead option in Connection for Co-Brokerage brings it in line with similar agent ad products offered by realtor.com rivals Zillow and Trulia, which feature competing agent branding and lead forms that connect consumers with up to three other agents per listing. By default, Zillow sends a lead to just one agent, but consumers can select up to two others (or three if the listing agent has claimed the listing) to connect with. 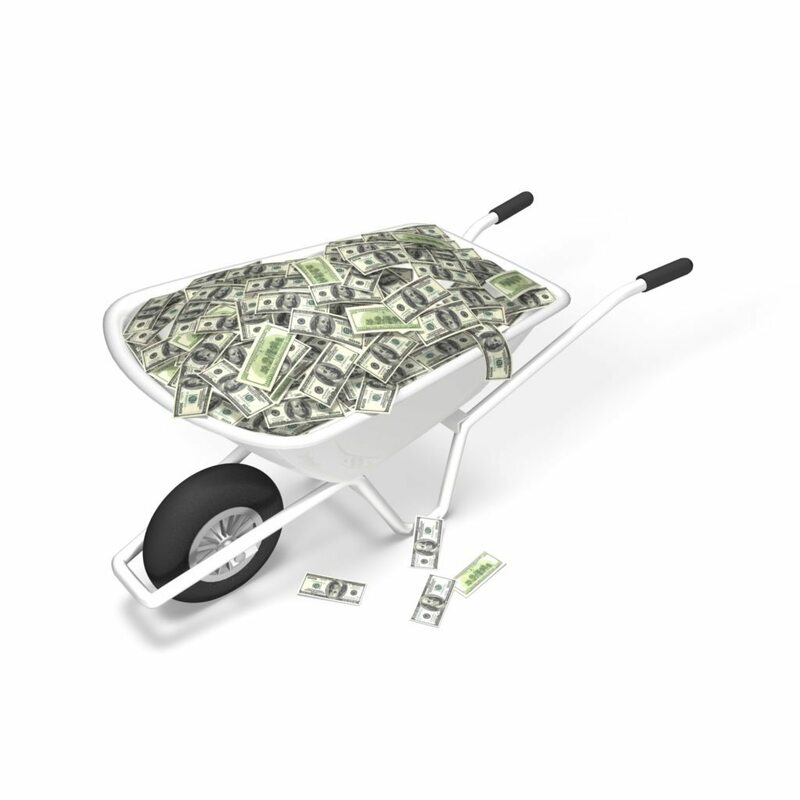 Providing leads to agents is big business for the three firms, which make the bulk of their revenue from the practice. Move, long the full-year revenue leader in the space, is on track to lose that position to Zillow in 2014. Daniel Furtick, a buyer’s agent with Keller Williams Realty in Columbia, South Carolina, didn’t like the changes to Connection for Co-Brokerage when he first heard about them from a realtor.com salesman approximately three weeks ago. Furtick, who began advertising on realtor.com in fourth-quarter 2012, highly values the exclusive leads that realtor.com offers through the Connection for Co-Brokerage program. Furtick, who represented buyers on 25 transactions in 2013, doesn’t advertise with Zillow and Trulia because consumers can send leads to more than one agent on those portals. If another agent gets a lead on the same contact, Furtick says he’ll be battling that agent for the buyer’s business until a contract is signed. It’s hard enough to usher a lead to a contract without the competition, he said. A 75 percent price hike for exclusive leads on Connection for Co-Brokerage was initially tough for Furtick to swallow. Furtick currently spends approximately $1,900 per month to advertise in 20 slots in nine ZIP codes on realtor.com. Those slots are grouped into different six-month contracts, and just a handful were up for renewal in July, he said. If he wanted to keep receiving exclusive leads from realtor.com on all 20 of his slots under the new program, he would have to pay an additional $1,425 per month for a total of $3,325. On the other hand, he could share leads with another agent for a 10 percent discount and pay a total of $1,710 per month. When he first heard about the changes, Furtick wanted to drop the program altogether. But thinking about the possible advantage of receiving phone numbers with a lead prompted him to test it out. “Phone numbers will increase conversion,” Furtick said. He will renew some of his July contracts in his top-performing ZIP codes with the new exclusive pricing and see how they perform, he said. Traditionally, Furtick says his lead-to-close ratio on realtor.com leads has been in the 3 to 6 percent range. If he’s on top of his game, the ratio hovers around 5 percent. He will measure the value of the new program against that success, he said. On the other hand, Matt Kelderman, an agent with Gilchrist & Company Real Estate in Dallas, embraced the new changes to Connection for Co-Brokerage as soon as he learned of them from a realtor.com salesperson. 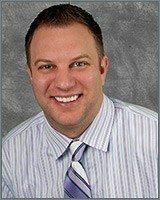 Kelderman started advertising on realtor.com in the program in April 2013 and now purchases slots in six ZIP codes for approximately $700 per month. Two of his ZIP code contracts were up this month and he renewed with the cheaper, nonexclusive option. He plans to re-up his remaining contracts at that option, too, when they come up. He’s comfortable with competition and is confident that he’ll follow up with leads before the other agent who receives the contact from the listing. “They’re not gonna react as fast as I do,” Kelderman said. He loves that leads will now come with phone numbers. “If I can get (a lead) on the phone or in front of (him or her), that’s awesome,” Kelderman said. He says the competition part of the new offering is great. “I’m gonna win most of those,” Kelderman said. “I think (the new Connection for Co-Brokerage offering) works to the advantage of agents who are on top of their business,” Kelderman said.